Conn 8M C-Melody with “Naked Lady” engraving, overhauled by me. Well you can’t polish it like I do without a full disassembly and removal of all corks, felts, and pads. So my way can’t be done outside of an overhaul, but hopefully you will find this instructive and helpful whether you aim to do it yourself or whether you just want to be more informed about the process. WARNING: Polishing is basically very slow and careful abrasion. 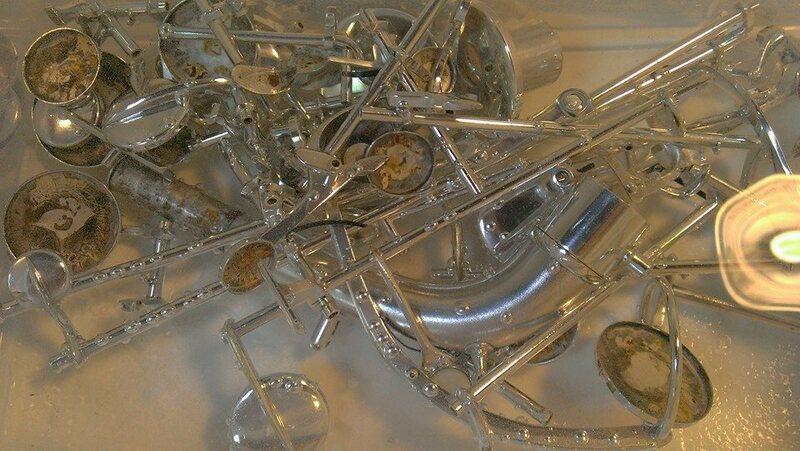 If you don’t know what you are doing, you can do permanent damage to the finish of your horn. 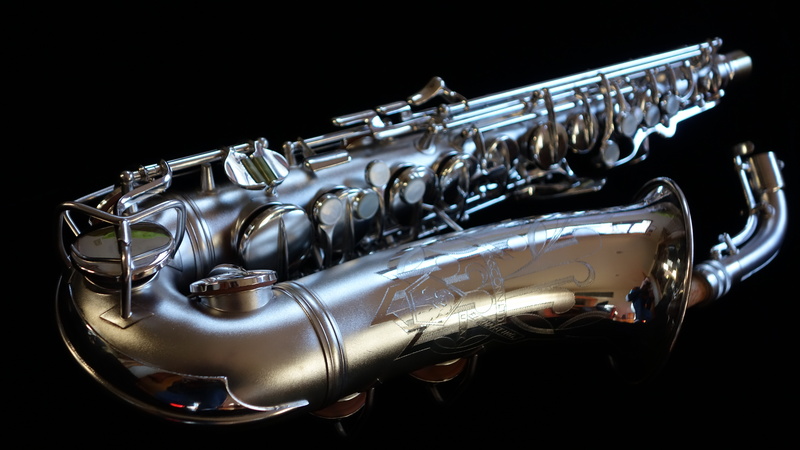 You CANNOT use a polishing liquid or cream or spray on an assembled saxophone- again they are abrasives, and the polish will work its way into your keywork and cause accelerated wear. I fully disassemble, removing all pads, felts, corks, and hinge rods. I clean with soap (I use Simple Green in a spray bottle followed by Sal’s Suds on a boar’s hair brush) and hot water, and I use pipe cleaners and q-tips dipped in naptha to remove dried oil and gunk from posts. This takes a couple of hours. Any dentwork or soldering that needs done gets done now. If the horn is getting a mechanical rebuild, that gets done before continuing. Then I’ll wash again and continue. Once the horn is completely clean (you can’t polish through grime, only through tarnish), any particularly rough areas of tarnish will get a spray of 1/4 strength Tarn-X (sulfamic acid aka silver dip) which is quickly rinsed away, or sometimes I’ll do a soak in a very dilute Tarn-X bath- however, sometimes I don’t use it, it depends on the horn. If I use the silver dip, I follow it with a very thorough repeat of the soap and hot water, rinsing until I’d be willing to drink the runoff. Either way, at this point I start using nitrile gloves, and don’t again touch the horn with my bare hands. After washing, dry with an air compressor. Once the keys are dry and clean and any really tough tarnish has been removed, I spray the horn and keys with Hagerty’s Silversmith spray polish, and polish by hand by ragging with a silver cloth from Allied Supply ( though you can get similar stuff elsewhere) torn into strips maybe 2 feet long and 2 inches wide for the body and 2 inches square for the keys. I use my hands and fingers most of the time, and really really get into it. The horn body I mount on a polishing fixture in my vise. The keys I polish in my hands or on a table with a soft cloth underneath, taking great care not to bend or damage anything. I polish every piece until the spray is gone. No bit of the spray can remain anywhere. Tearing the cloth into thin strips and threading it around tough to reach spots is good, as is using fingertips along key spines and other typically very tarnished areas. Use a fast motion with a good bit of pressure- the faster and more pressure you’ve got, the better it works. You may have to get creative to get it to reach in nooks and crannies. Finally, I usually go over it the really tough to reach spots next to the key spines and next to posts with a Dremel-mounted silicone polish wheel (I use the pink ultra fine found here)on a low speed setting. When the horn is finally fully polished, then repeat the soap and hot water wash, followed by a rinse until you’d drink the runoff and then dry with an air compressor. The soap and hot water wash at the end is extremely important- the “tarnish preventative” in most polishes leaves a greasy, dull finish full of tarnish particulate from the polishing process. When you wash at the end, you will be astounded to see the water coming off black until it eventually becomes clear. Then its padwork time- again, done with gloves on. This polishing process described above takes me a full day or more of constant work, and I’ll be sweaty at the end of it. Often I’ll polish the keys at night while watching a movie if the cleaning and/or body polishing took me a while to get right. Nothing really too special about it, its just a lot of work, and not everyone wants to pay for a full day of labor to do what can be done 60% of the way by a silver dip alone in about 5% of the time. My process for gold plate is basically the same, but minus the Tarn-X (it will thin the plate considerably, so avoid it) and a bit gentler on the polishing pressure and speed since its a softer metal. Do NOT polish gold until you are certain you have cleaned it extremely well- gold is non-reactive, and although the gold used to plate instruments is typically alloyed, a lot of the “tarnish” you see can dirt/grime/grease. 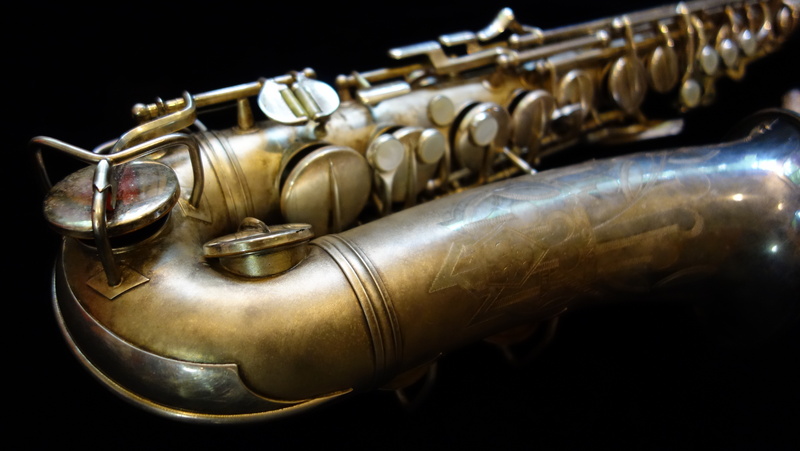 And since gold is soft and typically a thin layer (with the exception of some of the burnished instruments), you want to keep polishing to a minimum. See photos below for examples of the process and results. All horns in the photos are original plate, and none of them started out pretty. Click to enlarge. The Conn alto before and after have HUGE photos so you can really see detail and judge for yourself. 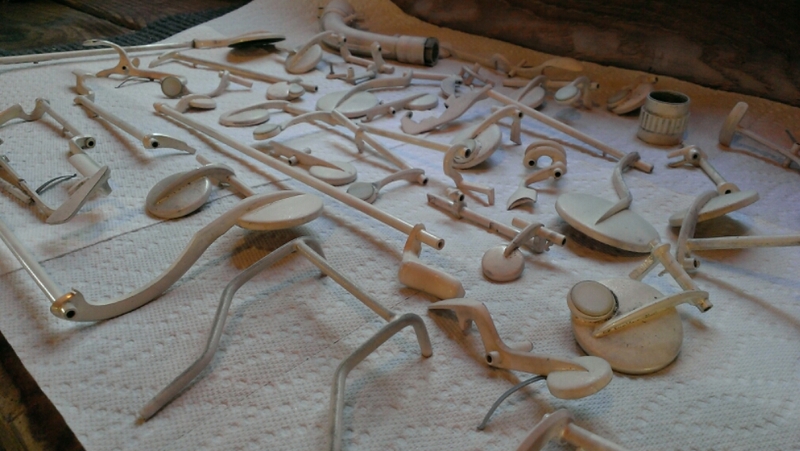 Keys cleaned and sprayed with polish, awaiting polishing. 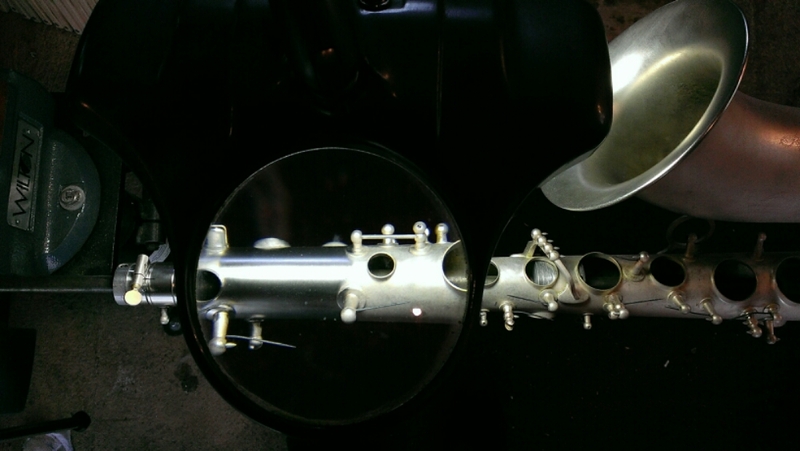 Horn body mounted on polishing fixture, mid polish. The type of ragging motion you’ll be doing do the horn mounted on the fixture. Final rinse of polished keys. These are underwater, in case its not clear. Seriously, if you wouldn’t be willing to drink the runoff then the keys aren’t clean enough. Conn 6M before cleaning and polishing. 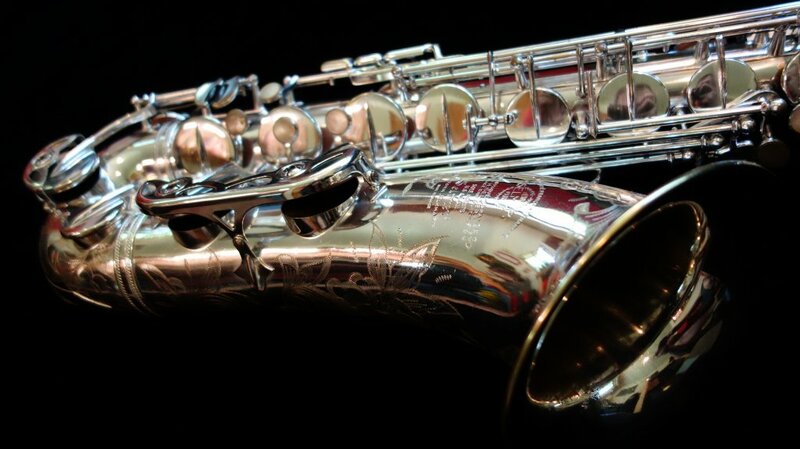 That same Conn 6M after cleaning and polishing. 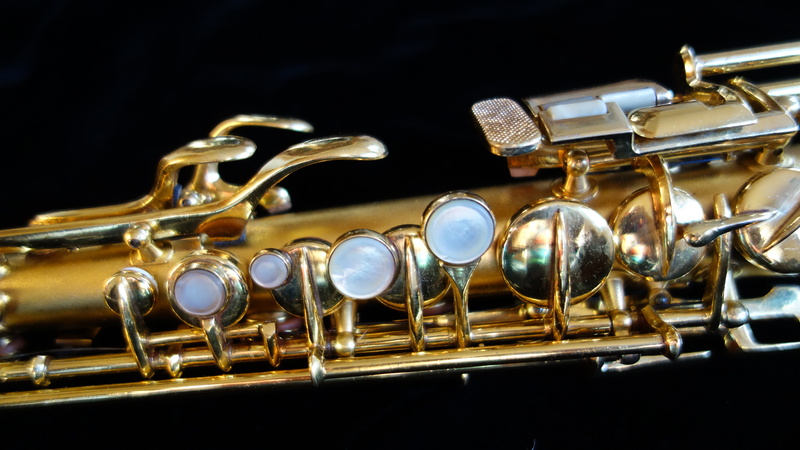 A gold plated Conn New Wonder Series II soprano I overhauled (and polished). Process is basically the same MINUS the Tarn-X and also a little gentler with the pressure and speed of hand-polishing. 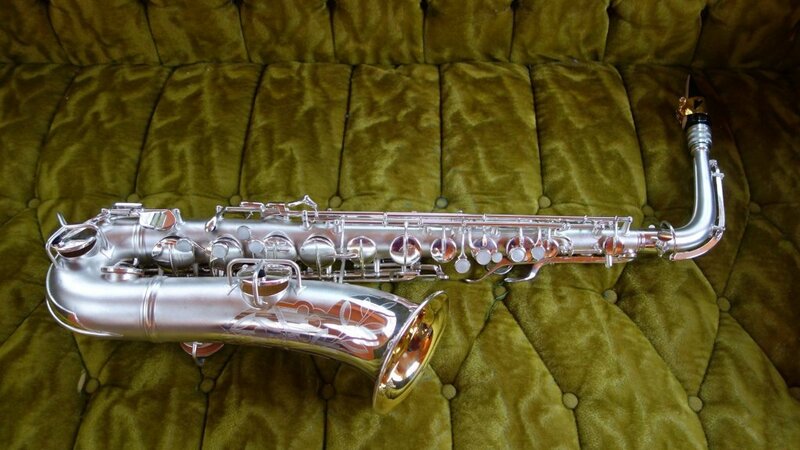 Selmer Super (Balanced) Action in silver plate that I overhauled and polished. All that said, plated horns- particularly silver horns- will tarnish. You can retard the tarnishing process by storing the horn wrapped in anti-tarnish silver cloth or keeping anti-tarnish strips in the case, but if you touch the horn, rest assured it will tarnish. I advise my customers to just keep the horn clean and let the rest happen naturally and we can polish it again in 7-10 years when the pads need replaced.